June Mar Fajardo has been, hands down, the most productive local player in the PBA this season, but who else joins him in the top ten? 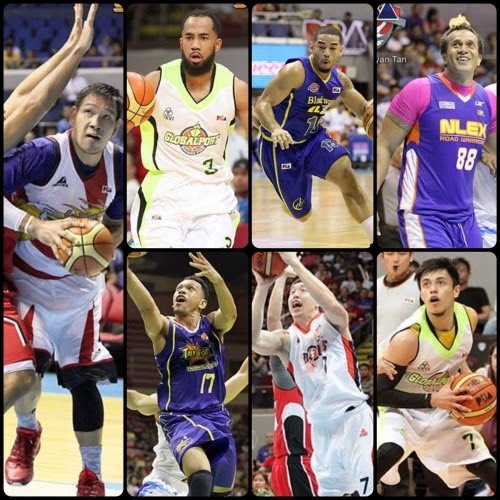 As Finals MVP for the previous conference, Arwind Santos is a shoo-in, right? How about top overall pick Stanley Pringle? The Beast? The Rock? Who else makes the cut? At least one name on this list will surprise you. - Despite his numbers and despite his team doing pretty well this conference, it seems like Cliff Hodge still doesn’t get the respect he deserves in the PBA. I mean, how is this guy not in the All-Star Game? It’s a friggin’ travesty. Here’s to hoping he continues to shut them haters up with his game post-All-Star. - Yes, folks, this year’s Rookie of the Year race has just become a two-horse affair with Heruela seemingly coming into his own for the Blackwater Elite. He was pretty much overlooked in the 2015 PBA Draft and for much of the previous conference, but the stocky Cebu product has slowly risen to be one of the most efficient guards in the league. He scores, rebounds, and defends with impunity. Oh, and don’t forget that he is currently the season leader in assists per game. - Romeo has been nothing short of fantastic this season. He has been better in every major statistical category and has become one of the country’s best offensive operators bar none. Yes, his shot selection is still a little crazy, and he’s still a bit of a ball hog, but, hey, he wouldn’t be Terrence Romeo otherwise. Without a doubt, he has become the face of the GlobalPort Batang Pier. - Without question, the biggest improvement in Jayson’s game this season has been his three-point shooting. Castro is third overall in 3pt% and leads all point guards with 52 threes made to date. Of course, it goes without saying that he is still maybe the most dangerous slasher in the country and that he is still a demon on the defensive end. He just keeps on improving as the seasons pass. - As good as Castro and Romeo have been, however, the numbers tell us that the best guard so far this season has been none other than 2015 top overall draft pick Stanley Pringle. Yes, his game has become a little unpredictable in the current conference, but his body of work since the start of the season is just insane considering he is just a rookie. He doesn’t score as much as his teammate Romeo, but he does all the other things like rebounding, playmaking, and defending, and how! - Santos is currently fourth overall in scoring, third overall in total rebounds, second overall in blocks, and has recorded 9 double-doubles so far. Oh, and he has the second-highest three-pointers made total in the season (just behind Dondon Hontiveros). He was well-deserving of the BPC in the Philippine Cup, but he needs to rediscover his game here in the Commish Cup if the Beermen are to climb out of the cellar. - The Rock continues to defy Father Time. Despite being 42 years old now, Asi remains one of the league’s top players. He is third overall in rebounding, and he has recorded 10 double-doubles in the season. He also continues to be one of the most recognizable and iconic players in the PBA. Too bad he’s stuck on a team that is hard-pressed to duplicate their semifinal finish in this same conference last season. - Abueva has been struggling in the current conference, but he is still certainly one of the top overall players in the league. Historically speaking, he has really struggled in the Commish Cup, but don’t be surprised if he regains his groove. He has scored in double-figures in three of his last four games, which should give him added momentum as Alaska fights to stay alive for the quarterfinals. - Gregzilla has silently built his sleeper case for season MVP. Okay, maybe it’s too early and that was a bit of a stretch, but nobody can turn a blind eye to how Greg has improved compared to his rookie campaign. Yes, there has been a slight drop in his blocks and FG%, but this is compensated by his increased scoring, rebounding, and aggressiveness. If Greg can continue playing with this demeanor, he may yet help Ginebra snare a crown and help himself overtake the #1 guy on this list. - Fajardo has ever so slightly slowed down in this, his third season in the pros. His scoring, rebounding, and blocking are all lower than last season, though not by much. And, well, he did help his Beermen win their first All-Filipino title in more than a decade, right? Most would say he’s the best overall player in the PBA, and new Gilas Pilipinas coach Tab Baldwin agrees, singling Fajardo out as the only sure holdover from the 2014 Gilas Pilipinas roster. June Mar has really been a revelation in the PBA, but the jury is still out on whether he can translate that to international competition.